The day to day lives of hedgehogs admitted to a sanctuary in Yorkshire. Sadly, Callie didn't make it. The wounds he had received from the dog bite were too serious.He died in his sleep after a week, but was cosy and secure with his brothers keeping him warm either side of him. Amos and Billie were now brothers in arms and they vowed to fight on. 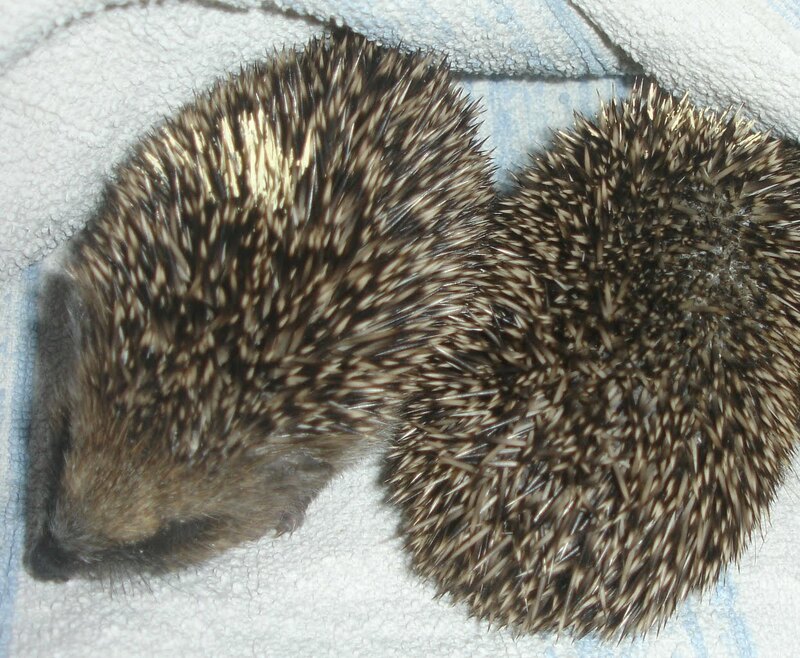 ACTION: Weight: Amos = 126g, Billie = 125g; Seven-day course of Baytril finished today (0.1ml twice a day for a week); still in kitchen on heat pad; food = esbilac (milk-substitute for puppies); Cow's milk can never be given to hedgehogs as they are lactose intolerant and it makes them poorly. Amos, Billie and Callie had had a really dreadful start to their day. At two o'clock in the morning a dog had come to their nest and dragged them all out. Their mother and one of their brothers had been killed by the dog and they and their sister were taken to the RSPCA in York by the person who found them the next day in their garden. Sadly, their sister did not survive the day, leaving Amos, Billie and Callie to face the world alone. They were picked up the same day and taken to the hedgehog hospital for emergency care and treatment. Action: Fuciderm ointment put on all bite wounds which had quickly developed into abscesses; all given esbilac which they lapped on their own; all started on a regime of Baytril (oral antibiotic)(0.1ml twice day for seven days); all given access to a heat pad. Weight: Amos = 126.2g, Billie = 135.8g, Callie = 93.2g. They were all marked using emulsion paint to distinguish them from one another. A small amount was painted on the spines in a different place on each of them. Roger had friends. Of that he was quite sure. He hadn't actually met any of them yet but he knew they were out there somewhere, and when the moment was right he would meet them. Time was not an issue with Roger - he had all the time in the world. Life was good being a hedgehog. Action: Keep in Quail brooder in kitchen (intensive care unit), put on a heat pad, hand-feed esbilac using 1 ml syringe, several times a day, start regimen of Baytril antibiotic administered orally twice a day. Winter was fast approaching and Roger was not a good candidate for releasing back to the wild. Earlier in the autumn he had narrowly escaped with his life after a serious bout of pneumonia and had adjusted well to a life of comfort and ease. Was he going stir crazy? Hard to tell as had adopted a fixed routine: Rushes out of his bedroom when he his name being called, stuffs himself with Pedigree Chum Puppy Food, poos, wees and returns to bed. Seems pretty happy by all accounts. But what of the wider world? What lay outside? Unceremoniously he found himself removed to the garden amongst the grass and plants - okay so far he thought (or rather grumbled to himself) for Roger, as you will have gathered by now, is a hedgehog with attitude. After a ramble round the garden he seemed satisfied that all in the world was as he had left it. He was returned to his deluxe house to a clean bed and yet more food and settled down to a dreamless sleep. Adventure over for this day at least!